Q: It took some time, but I recently landed a job that will allow me to begin saving some money. My company offers a 401(k) and a 3% match, but I also have college debts of $15,000 and a credit card balance of $650. How do you recommend I proceed? The habits you set with your first paychecks are a strong predictor of your financial future. You will likely feel like you are making very little progress during the first few years, but I assure you that frugality will pay big dividends in the future. Consider the new super-efficient Boeing 787 Dreamliner’s takeoff trajectory. As the plane moves down the runway, you see very little progress. At liftoff, the plane is only inches from the ground. But before long, the plane is sailing through the sky. This calculator assumes that you invest your savings but you can adjust this calculation down to 0% if you prefer to imagine yourself putting this savings in a piggy bank. Back to the practical next steps; Make sure you have at least a one-month emergency reserve account before you start any savings or debt repayment. This will eventually need to be built up to three months of savings that you put in a bank certificate of deposit (CD) or other hands-off account. Your credit card balance is low enough that I would suggest knocking it out next. Even if the balance is on a low-interest rate card, you will likely need to transfer it to a new card when the grace period ends. Money-wise people know that credit card debt is bad debt. Your next priority should be your 401(k) match. This 3% match is a 100% return on the first year of your investment. You will not find this type of return anywhere else. It’s even better if your company offers a Roth 401(k) option for your savings. Any additional savings beyond the match should go into a Roth IRA. Roth IRAs are perfect for young savers because you are building a nest egg that you can take out tax free when you retire. Roths can also be used as a savings vehicle for your first home. I would need more information about your college loans before I can safely make a recommendation. If they are federally subsidized loans, stretch out the payments for as long as you possibly can. Other types of private and federal loans carry higher interest rates. Many college graduates need to make hard decisions between saving and paying down debts. The correct answer depends on comparing the interest rate on your debt and your expected growth rate from the investment. A rate of 5% is a good hurdle. Debts incurring interest above 5% annually should typically be paid off as soon as possible. Make sure you write down your goals and talk about them with friends and family. Vocalizing your goals will help you realize them. Automate your savings and debt repayments through your paycheck and your local bank. And keep smiling because it will only be a matter of time before you reach cruising altitude. If you have a money question that is nagging at you, please submit it using our contact page. We try to respond to every question. If yours is chosen for MONEY QUESTIONS, we will give you a pseudonym and let you know the date the Q&A is published. 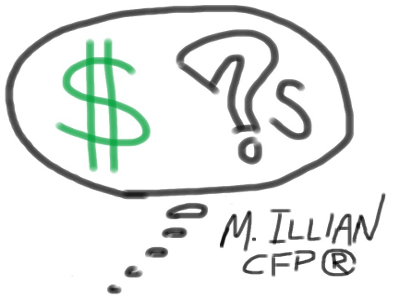 $ ?s: How do I determine which debts I should pay off first?